Jackson Pollock lived a short and troubled life that ended at the age of 44 in an alcohol related automobile accident. In 1942 he created Male and Female. During this period, Mr. Pollock was under intense psychoanalysis. It is believed by many that the therapists treating him encouraged his art-making as a means of treatment. Male and Female appears to have been a part of this exercise. 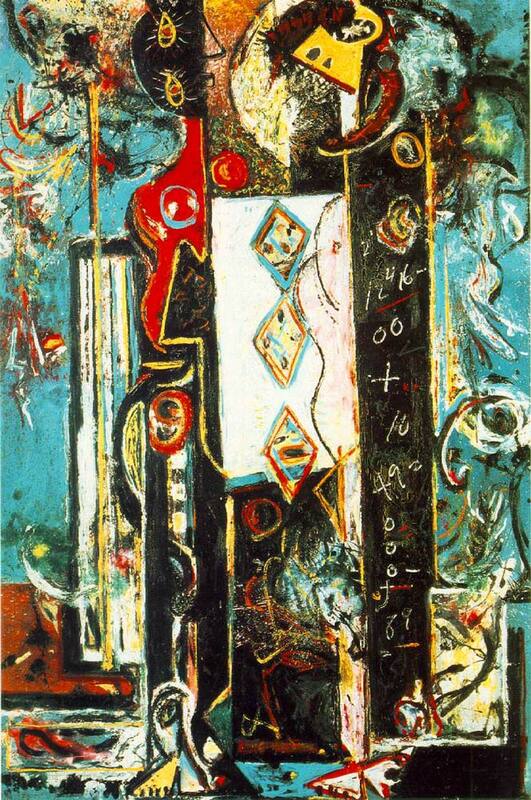 Pollock was heavily influenced by fellow painters, Joan Miro and Pablo Picasso. It is obvious that the distortion of the human form present in Male and Female stems from the similar Surrealist and Cubism art forms of the aforementioned artists. The work is currently on display at the Philadelphia Museum of Art. Male and Female portrays a man and woman using bold colors and in an extreme abstract form. The figure on the right appears to have a blackboard type surface as a body displaying numbers and mathematical symbols. The image to the left is less identifiable except for the appearance of two long lashed eye openings. They appear to be joined in the center by a surface containing 3 triangles and what looks like a partial, almost ghostlike child figure. Male and Female is of the Abstract Expressionism art form.